Porsche SE CEO Poetsch: "The VW Group is in a very robust state." STUTTGART -- Porsche Automobil Holding SE returned to profit as its billionaire owner family is in talks to buy out Ferdinand Piech following a clash between the former Volkswagen Group patriarch and his relatives. Profit after tax was 1.37 billion euros ($1.48 billion) in 2016 after a 308 million-euro loss a year earlier triggered by VW's diesel-emissions scandal, the investment vehicle that holds the Porsche and Piech families' controlling stake in VW Group said Tuesday. "The year 2016 was more for Volkswagen than dealing with the diesel crisis," Porsche SE CEO Hans Dieter Poetsch, who is also VW's chairman, said at a press conference here. "The group has set the course for the biggest transformation in its history." Porsche SE said on Friday that the Porsche and Piech families are preparing to buy a substantial part of a 14.7 percent stake in the holding company from Ferdinand Piech, a former chairman of VW Group. 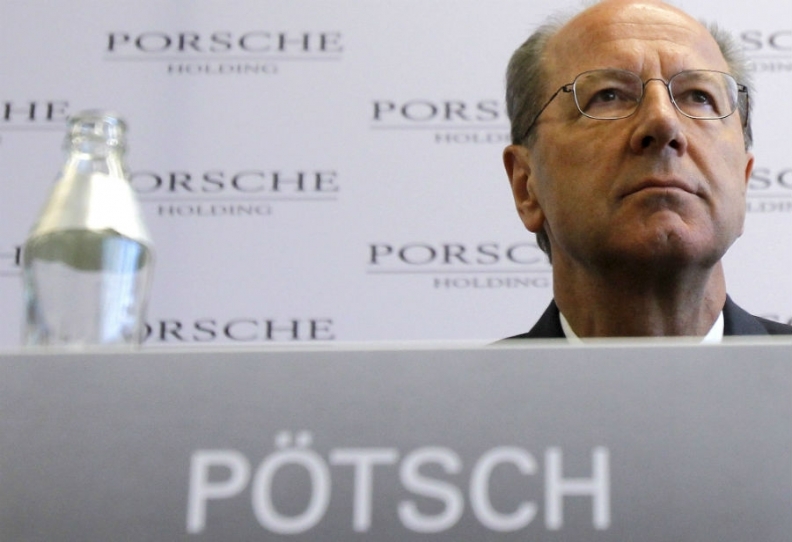 On Tuesday Poetsch said Porsche has no information about Piech's talks with the carmaker's controlling families about a possible sale of his stake. "We are only informed about the fact that talks are happening," Poetsch said. "We cannot even say whether there will be a result." If the negotiations to buy Piech's stake in Porsche SE succeeds, it would have no impact on the holding company's ownership structure, Poetsch said. "There will be no change to the fact that the voting shares will be held by the Porsche and Piech families," Poetsch said. Porsche SE said it expects its net profit to rise to between 2.1 billion euros and 3.1 billion euros, as VW pushes steps to overcome its diesel emissions crisis. "The VW group is in very robust state," Poetsch said. "There is a goal for the 2017 business year to build on the operating success of last year." Net liquidity should come to between 1.0 billion and 1.5 billion euros, Porsche SE said. Net liquidity fell to 1.3 billion euros last year from 1.7 billion euros in 2015 mainly because dividend payments. While the family could potentially tap that resource to finance a deal with Piech, any special payout would have to be shared with preference shareholders outside the clan. Cashing out of his stake and ceding his seat on Porsche SE's supervisory board would end Piech's role at the investment vehicle and Volkswagen, where he was a key figure in its transformation into a global automaking leader over two decades. Piech, 79, resigned abruptly as Volkswagen chairman two years ago after losing a power struggle with then-CEO Martin Winterkorn. Five months after his withdrawal, the carmaker's diesel-emissions scandal came to light and triggered Winterkorn's departure as well. Since then, Piech has further isolated himself with allegations that other VW supervisory board members, including his cousin Wolfgang Porsche, knew earlier than they'd admitted that the company had developed technology to rig as many as 11 million vehicles to cheat on emissions tests. The directors have denied the claims. Piech's comments, made during investigations into the roots of the cheating, were reviewed during an external probe by U.S. law firm Jones Day and found to be implausible, Poetsch told reporters this month at the Geneva auto show. Porsche SE is now wholly an investment company after Volkswagen, its primary asset, took control of the Porsche sports-car brand in 2012. While Piech's grandfather, Ferdinand Porsche, created the manufacturer bearing his name and designed VW's Beetle car, equity links between the companies only date back to 2005. The holding company controls 52.2 percent of VW's voting shares. Piech is one of only a handful of clan members with a sizable voting stake in Porsche SE. His 14.7 percent holding is valued at about 1.1 billion euros. Stakes of the younger generations are largely fragmented with the notable exception of Peter Daniell Porsche, a nephew of Wolfgang Porsche. After Piech's older brother Ernst tried to sell his Porsche stake in the 1980s to investors from the Middle East, the family adopted a requirement that any member must offer the stock to his or her relatives before considering a sale to an outside investor. Terms for the compulsory tender include a cap that prevents the seller from asking for a price exceeding the family's financial muscle, according to people familiar with the matter. The company reiterated that it is considering investments in businesses related to the auto industry. Porsche SE created a management-board position dedicated to those assets five years ago but hasn't completed a major purchase beyond a 10 percent minority stake in U.S. traffic information provider Inrix for $55 million in 2014. The value of that investment was cut to 21 million euro last year, Porsche SE said Tuesday. Porsche SE plans to keep its dividend stable at 1.01 euro per preferred share, its only publicly traded stock, and 1.004 euro per ordinary share, which translates into a total payout of about 308 million euros. All the ordinary stock, which carries voting rights, is held by the Porsche and Piech families. The clan bought back a 10 percent voting stake from Qatar four years ago after the Persian Gulf sheikdom helped keep Porsche SE afloat in 2009, when financing of its planned takeover of Volkswagen dried up. Poetsch played a key role in brokering a complex deal at the time that installed the Porsche and Piech family as VW anchor shareholders while VW executives took over operational control.